Lino Rulli with CatholicTV interviewed Kansas City – St. Joseph Bishop Robert W. Finn between sessions at the National Catholic Youth Conference today. This video is a raw capture of that interview. CatholicTV will edit from their own video of the interview for a segment with other bishops as well. So check back there. Much thanks to John Baccala for splicing in some pics from NCYC events into this footage. Earlier today Stephanie Mueller, a remarkable student from St. Pius X High School in Kansas City, shared in front of 22,000 of her peers how she is trying to respond to Christ’s call to serve others. We’ve covered her project a few times on this blog, but let her explain it. Standing on the stage of Sprint Center in KC, she has no notes and no teleprompter and she’s as confident as she could be. There’s a lot of hope for the future with Catholic youth like these. UPDATE - Lots More Pics Here. USCCB Letter to Senators: Reid-Care "is not true health care reform"
The following was sent by the United States Conference of Catholic Bishops today to every member of the Senate urging essential changes to the just unveiled Senate version of health care reform which Senator Harry Reid (D-NV) intends to push through in the dark of night on Saturday. The bishops find it objectionable not only on the basis of its inclusion of state-funded abortion, but also for its exclusion of immigrants from care, and amazingly, for its failure to adequately address accessibility and affordability for the poor – presumably the reason we’re engaged in this reform effort in the first place. It seems Reid-Care is garbage from top to bottom and tomorrow it will be effectively rammed through the Senate unless a cloture vote fails. The Capitol switchboard was down some time today. You can follow this link to find various ways to contact your Senator. Please contact her or him before the vote tomorrow. Urge them to vote NO on cloture – and don’t accept the excuse that they just want the bill to be heard – 97% of Senate bills that achieve cloture also pass. - include strong provisions for adequate affordability and coverage standards. The Catholic Bishops of the United States have long supported adequate and affordable health care for all. As pastors and teachers, we believe genuine health care reform must protect human life and dignity, not threaten them, especially for the most voiceless and vulnerable. We believe health care legislation must respect the consciences of providers, taxpayers, and others, not violate them. We believe universal coverage should be truly universal, not deny health care to those in need because of their condition, age, where they come from or when they arrive here. Providing affordable and accessible health care that clearly reflects these fundamental principles is a public good, moral imperative and urgent national priority. Sadly, the legislative proposal recently unveiled in the Senate does not meet these moral criteria. Specifically, it violates the longstanding federal policy against the use of federal funds for elective abortions and health plans that include such abortions - a policy upheld in all health programs covered by the Hyde Amendment, the Children’s Health Insurance Program, the Federal Employee Health Benefits Program - and now in the House-passed “Affordable Health Care for America Act.” We believe legislation that violates this moral principle is not true health care reform and must be amended to reflect it. If that fails, the current legislation should be opposed. Specifically, we urge you to include the House-passed provision that keeps in place the longstanding and widely supported federal policy against government funding of elective abortions or plans that include elective abortions. In the aftermath of the overwhelming and bipartisan House vote for the Stupak-Smith-Ellsworth-Kaptur-Dahlkemper-Pitts Amendment, there has been much misunderstanding of what it does and does not do. This amendment does not change the current situation in our country: Abortion is legal and available, but no federal dollars can be used to pay for elective abortions or plans that include elective abortions. This provision simply keeps in place existing policy and allows Congress to honor the President’s commitment that “no federal dollars will be used to fund abortions.” The amendment does not restrict abortion, or prevent people from buying insurance covering abortion with their own funds. It simply ensures that where federal funds are involved, people are not required to pay for other people’s abortions. Thus far, the pending Senate bill does not live up to President Obama’s commitment of barring the use of federal dollars for abortion and maintaining current conscience laws. The bill provides federal funding for plans that cover abortion, and creates an unprecedented mandatory “abortion surcharge” in such plans that will require pro-life purchasers to pay directly and explicitly for other people’s abortions. Its version of a public health plan (the “community health insurance plan”) allows the Secretary of HHS to mandate coverage of unlimited abortions nationwide, and also allows each state to mandate such abortion coverage for all state residents taking part in this federal program even if the Secretary does not do so. The bill seriously weakens the current nondiscrimination policy protecting providers who decline involvement in abortion, providing stronger protection for facilities that perform and promote abortion than for those which do not. The legislation requires each region of the insurance exchange to include at least one health plan with unlimited abortion, contrary to the policy of all other federal health programs. Finally, critically important conscience protections on issues beyond abortion have yet to be included in the bill. To take just one example, the bill fails to ensure that even religious institutions would retain the freedom to offer their own employees health insurance coverage that conforms to the institution’s teaching. On these various issues the new Senate bill is an enormous disappointment, creating new and completely unacceptable federal policy that endangers human life and rights of conscience. We support the inclusion of all immigrants, regardless of status, in the insurance exchange. The Senate legislation forbids undocumented immigrants from purchasing health-care coverage in the exchange. Undocumented immigrants should not be barred from purchasing a health insurance plan with their own money. Without such access, many immigrant families would be unable to receive primary care and be compelled to rely on emergency room care. This would harm not only immigrants and their families, but also the general public health. Moreover, the financial burden on the American public would be higher, as Americans would pay for uncompensated medical care through the federal budget or higher insurance rates. We also support the removal of the five-year ban on legal immigrants accessing federal health benefit programs, such as Medicaid, the Children’s Health Insurance Program, and Medicare. Legal immigrants, who work and pay taxes, should have access to such programs if needed. Removing the ban would help ensure that legal immigrants, who were widely praised in past immigration debates for their many contributions and for playing by the rules, will still have access to health care. The Catholic bishops have advocated for decades for affordable and accessible health care for all, especially the poor and marginalized. The Senate bill makes great progress in covering people in our nation. However, the Senate bill would still leave over 24 million people in our nation without health insurance. This is not acceptable. The bishops support the expansion of Medicaid eligibility for people living at 133 percent or lower of the federal poverty level. The bill does not burden states with excessive Medicaid matching rates. The affordability credits will help lower-income families purchase insurance coverage through the Health Insurance Exchange. However, the Senate bill would still leave low-income families earning between 133 and 250 percent of the federal poverty level financially vulnerable to health care costs. Overall, the average subsidy provided for in the Senate bill is $1,300 less than the average subsidy in the House bill. Improvements to the bill should be made so that low-income families have reasonable out of pocket expense for health care. Immediate reforms are included in the bill that should be helpful in providing relief to the uninsured and underinsured. Additionally, reforms that will strengthen families and protect low-income and vulnerable people such as eliminating denial of coverage based on pre-existing conditions including pregnancy; eliminating life time caps; offering long-term disability services; and extending dependent coverage to uninsured young adults -- are significant steps toward genuine health care reform. We urge the Senate to maintain these provisions. These moral criteria and policy objectives are not marginal issues or special interest concerns. They are the questions at the heart of the health care debate: Whose lives and health are to be protected and whose are not? Will the federal government, for the first time in decades, require people to pay for other peoples’ abortions? Will immigrants be worse off as a result of health care reform? At their core, these health care choices are not just political, technical, or economic, but also moral decisions. This legislation is about life and death, who can take their children to the doctor and who cannot, who can afford decent health care coverage and who are left to fend for themselves. Our appeal for health care legislation that truly protects the life, dignity, health and consciences of all reflects the unique perspectives and experience of the Catholic community. Our hospitals, clinics, and long-term care facilities provide quality health care to millions. Our dioceses, institutions, and ministries purchase health care for many thousands of employees and their families. Our emergency rooms, shelters, clinics, and charities pick up the pieces of a failing health care system. Our Catholic moral tradition teaches that health care is a basic human right, essential to protecting human life and dignity. For many months, our Bishops’ conference has been working with members of Congress, the Administration and others to fashion health care reform legislation that truly protects the life, dignity, health and consciences of all. Our message has been clear and consistent throughout. We hope and pray that the Congress and the country will come together around genuine reform. Archbishop Joseph Naumann and Bishop Robert Finn in their recent pastoral letter on health care provide sensible guidance in the reform debate. That the American people deserve better access to affordable care is not in question but rather whether the federal government is the proper actor to provide this access. Experience shows that people’s needs are best handled locally whenever possible. This principle of subsidiarity has a long history in the church’s teachings. Some people may question the interpretation of subsidiarity given in the letter by Naumann and Finn. But the authority of the bishops is bolstered by the quotations in the letter from Popes John Paul II and Benedict XVI, and indeed the principle applies to the current debate. Naumann and Finn also address another concern perhaps more concrete in taxpayers’ minds. Are public funds really going to pay for elective abortions and other morally questionable procedures? It was only after much wrangling that the House amended its version to specifically prevent public funding for abortions. Now we wait to see whether the Senate follows suit. Those who are shepherding this bill through Congress seem reluctant to codify an exception for abortion and euthanasia, even as they say such things will not be paid for with our money. •A truly universal health policy with respect for human life and dignity. •Access for all with a special concern for the poor and inclusion of legal immigrants. •Pursuing the common good and preserving pluralism including freedom of conscience and variety of options. •Restraining costs and applying them equitably across the spectrum of payers. Naumann, Finn and the other U.S. bishops are right to remind us of the duty we have to protect the most vulnerable patients, and any health care legislation that fails to do so, no matter how well intentioned it may be, cannot be morally justified. Austin Welsh is a geriatrician. He is a lifelong Catholic and serves as the first president of the Kansas City Guild of the Catholic Medical Association. He lives in Overland Park. In recent weeks, much has been written about the Catholic Campaign for Human Development. While it is true that CCHD funded community organizing groups such as ACORN in the past, the Campaign ended its relationship with ACORN two years ago and has not renewed it. At the present time, CCHD is examining all funding groups. They have affirmed that they cannot fund any group involved in partisan politics or groups that promote causes contrary to Church teaching. Within our diocese, I review all CCHD grant applications and approve proposals only after a careful review. I take every precaution to ensure that groups that receive CCHD funds are appropriate. In its history, the Catholic Campaign for Human Development has done much good. We would like to see such programs continue so that we can help people help themselves. The continuation of CCHD will depend on how seriously the Campaign takes the mandate of its benefactors to act within the parameters of Church teaching. I expect the CCHD collection to be taken this year, but individual donors will show their support -- or lack thereof -- according to their own choice. The Catholic Campaign for Human Development was established in 1969 and is the U.S. Bishop’s effort to address the root causes of poverty. The National Catholic Youth Conference is meeting in Kansas City this week. 21,000 American Catholic High School students from as far as Japan (Military Archdiocese) are meeting here to deepen their faith and praise God. They are joined by about 4,000 volunteers and a couple dozen bishops, including Cardinal Daniel DiNardo (Keynote), Kansas City, Kansas Archbishop Joseph Naumann, Kansas City-St. Joseph Bishop Robert Finn (Mass celebrant), Sacramento Bishop Jaime Soto (Homilist) and newly named Ft. Wayne-South Bend Bishop Kevin Rhoades. The Catholic Key produced a welcome paper for all the participants and I was busy today handing those out, so I didn’t get to go to any of the festivities. But the kids were uniformly well-behaved and the priests and nuns who came through were almost all younger than me. Tomorrow, the whole bunch will take part in a Eucharistic Procession throughout downtown Kansas City. The Holy Father was pleased to be informed of the 2009 National Catholic Youth Conference taking place in Kansas City, and he happily sends cordial greetings to Your Excellency, your brother bishops, the young people, the chaperones, and all taking part in this joyful event. As the young people celebrate and reflect upon the theme “Christ Reigns” through song, fellowship and prayer, His Holiness encourages them to have no fear in professing – at home, in their parishes and in their schools – that Jesus is King! The Holy Father invites them to recall that each time they gather for worship, they join the angels and saints in heaven in singing the “Song of the Lamb”: “Great and wonderful are your works, Lord God Almighty. Just and true are your ways, O King of the Nations. . .For you alone are holy. All the Nations will come and worship before you” (Rev 15: 3-4). As they process through the streets of Kansas City bearing witness to the love of Jesus present in the Most Holy Eucharist, His Holiness is confident that the young people will find new strength to grow in God’s wisdom and to work for the spread of His Kingdom – some even finding the courage to make the radical choice of following Christ as priests or religious. In trusting all of them to the maternal care of the Blessed Virgin Mary, he affectionately imparts his Apostolic Blessing. Well, not so much these days. So when a note of respect ekes out of print or the airwaves, it merits a shout-out. If you missed the debate, allow me to summarize. Dead Chinese people, skinless, plasticized and posed in various states of activity are hauled around from city to city. About the time “Bodies” came to Kansas City, ABC's Brian Ross conducted an investigation into the company who “owns” the bodies and built a very chilling case. Those human beings on display were very likely Chinese prisoners, executed and then sold. It was a joint statement from Joseph F. Naumann, Archbishop of Kansas City in Kansas, and Robert W. Finn, Bishop of Kansas City-St. Joseph. Since most of the readers here are not from the Kansas City Metro, you might not get the significance of a stand against “Bodies”. It was the most hyped event I’ve seen in my two and a half years here. Business, media and government were all full-force behind it as a step in saving Kansas City’s financially-troubled, landmark Union Station. To oppose “Bodies” was to oppose Kansas City. The bishops’ opposition to “Bodies” brought them much more ridicule on the local level than their more widely known stands which have garnered national attention. Their stand on “Bodies” turned out to be prophetic as well, since we now know that the proof of consent for the use of these Chinese bodies was non-existent and several legislatures have now regulated these corpse shows. Anyhow, to the point of this post – Thank you Mr. Stigall. It’s much appreciated and very refreshing at this particular time. Do read the rest of his column. On Wednesday morning I was able to catch up with Bishop Salvatore Cordileone, former Auxiliary Bishop of San Diego who earlier this year became the Bishop of Oakland. He's part of the new generation of relatively young, unabashedly orthodox, prematurely balding (not sure what that has to do with anything, but it's mostly true) bishops to arrive on the scene in recent years. Bishop Cordileone is a canonist and an obviously bright guy. He forthrightly acknowledges that now as the bishop of his own diocese the buck stops with him, and he has the look--natural confidence combined with divine grace--of someone who's up to that responsibility and challenge. Not terribly unlike our own Bishop Finn in that regard. We had just come out of a presentation on the state of religious communities in our country (the religious brother who gave the talk rode the shuttle with me to the airport this afternoon). This topic captured Bishop Cordileone's interest. He noted that Oakland has many religious communities. He wants to give them encouragement while at the same time foster among the faithful a greater awareness and consequent appreciation of the huge contributions of consecrated religious to the Church and indeed to the world. Bishop Cordileone participated in the apostolic visitations of U.S. seminaries a few years back, and while he grants that these can be intimidating at first, he reports that he was well-received at the seminaries he personally visited, which ended up being a very positive experience despite any concerns or fears going into it. He sees a similar dynamic at work in the current apostolic visitation of women's religious communities, which presents a singular opportunity for renewal of religious houses and individual consecrated religious. He says that if the process is embraced in a spirit of dialogue and ecclesial communion (there's the rub, I'm afraid), the visitation will be a win/win experience for all concerned. The conversation then shifted to the sacred liturgy. He was quick to point out that we're not merely dealing with new texts, but with a moment of profound "renewal in the 'spirit of the liturgy,'"deliberately drawing from the phraseology of Pope Benedict XVI. In overseeing the liturgical renewal in Oakland, he stressed the importance of organic development. Like Pope Benedict, he views liturgical renewal within a "hermeneutic of continuity"--in other words, he understands the present changes in the larger context of the Church's rich liturgical tradition. He's intent on building on the past, not discarding it. His refreshing liturgical mindset is not stuck in the past, but it does incorporate the past, bringing a richness and vitality to our 21st-century liturgical celebrations. As we were ending our conversation, I had to lightheartedly play the "AFC West card." I asked him if he was getting any grief as a life-long San Diego resident who now finds himself the Bishop of Oakland. He smiled and acknowledged some friendly banter, I think beleaguered Chiefs fans who haven't had much to smile about lately should be humored by the fact that the new Bishop of Raider Nation is actually a Chargers fan! Leon Suprenant is in Baltimore covering the USCCB Fall meeting for The Catholic Key. Below is a report on his interview with Bishop Kevin Rhoades of Harrisburg, recently appointed to Fort Wayne-South Bend. Check in later today for Leon’s interview with Oakland Bishop Salvatore Cordileone (UPDATE - Here's the Bishop Cordileone Interview). This has been quite a week for Bishop Kevin Rhoades of Harrisburg, PA. On Saturday it was announced that he has been named as the new Bishop of Fort Wayne-South Bend. Then at this week's bishops' meeting, he was elected as the new chairman (effective one year from now) of the committee on laity, marriage, family, and youth. I've had the good fortune of talking with him throughout the week, and this morning I interviewed him regarding his new responsibilities. His initial reaction to the appointment was one of surprise. He didn't expect any transfer, and he certainly had no idea that he was being considered for Fort Wayne-South Bend. It just wasn't on his radar screen. He had a few weeks' notice before the official announcement. He used that time as an opportunity for prayer, and he is very much at peace with this new challenge. He says it's very much like his "leaving home" experience when he entered seminary. This time he is leaving behind a diocese that he has served as an ordained minister for over a quarter of a century, over which time he has developed many close friendships. He sees this new assignment as the Lord asking him to follow Him in a new and total way, much like the apostles who were called to set aside the fishing nets and begin a new way of life. So, going to land of the Golden Dome as shepherd is what the Lord is calling him to embrace and, in common parlance, he's good with it. Bishop Rhoades is, however, most grateful for the welcome he has already received from Bishop D'Arcy and others in his new home. He recognizes that he has big shoes to fill, but he says Bishop D'Arcy is a "gracious, kind man" who is making the transition very easy for him. The two of them have been seen together multiple times during the bishops' meeting, as Bishop D'Arcy clearly has been offering him fatherly wisdom as the torch is passed. Bishop D'Arcy is in good health, and Bishop Rhoades expects him to continue his service to the diocese while in his retirement. But what about Notre Dame? Bishop Rhoades says he was one of the 80 or so bishops who expressed concern about ND's honoring a pro-choice politician. Bishop Rhoades says he communicated with Fr. Jenkins privately. Later, as the controversy developed, more public commentary was provided with the assistance of Paul Schenck from his pro-life office, as described here. He rejected the claim that many bishops disagreed with his views on the subject, confidently asserting that the "great majority" of bishops were with him on the subject. He points out that his position on the matter is that of Bishop D'Arcy, as reflected in the latter's piece in America. He sees the promotion of "the Catholic identity and mission" of Notre Dame as his role when it comes to Notre Dame, while emphasizing the pastoral dimension and his (and Bishop D'Arcy's) great love for Notre Dame and its potential for good. The biggest difference in his new assignment is just that--the colleges. While Harrisburg and Fort Wayne-South Bend are comparable in terms of size, Harrisburg has no Catholic colleges, while Fort Wayne-South Bend has five, including ND. I asked him where he was going to start. He clearly stated that building strong personal relationships has to be foundational. In that regard, he mentioned a social gathering at the conference last Sunday, where he and Bishop D'Arcy were able to have some cordial, constructive conversation. He believes that bringing out the best in Notre Dame and other Catholic colleges will require such a dialogical approach. He surely understands the challenges and he's not about to cave in on core principles, but his outlook strikes me as being a godly one. In short, I think this is another episcopal appointment that the Church got right. Before going back into the executive session of the meeting, Bishop Rhoades also spoke briefly of his appointment as head of the laity, marriage, family, and youth committee. He will be the chairman-elect for one year, during which time he will observe and familiarize himself with the committee's work. He notes that one of the bishops' priorities as expressed in their pastoral plan is to strengthen marriage, so Bishop Rhoades anticipates that this will be a particular focus of the committee under his watch. He also pointed out to me that he has a substantial background and interest in youth ministry, so he looks forward to that aspect of the committee's work. He enthusiastically notes that his committee will be involved with the 2011 World Youth Day in Madrid. He attended the last WYD in Sydney, and heartily looks forward to Madrid as a special moment of grace for the Church. Lastly, Bishop Rhoades finds it significant that he will be installed as Bishop of Fort Wayne-South Bend on January 13th, the feast of St. Hilary (which he's quick to point out was a male and a great doctor of the Church), only a week before the annual March for Life. And here we see what makes Bishop Rhoades tick. One of his first acts as bishop will be to celebrate Mass for those (including many ND students) who will be taking buses to DC for the March, which will give him an opportunity to preach, to stress the importance of life issues, and in that context invest himself in the lives of ND students, faculty, and staff. All I can say is, "Cheer, cheer for 'ol Bishop Rhoades!" And (we hope!) God saw that it was good. All that may sound off-putting, but in essence these "propers" and "commons" refer to prayers said at Mass at different times, which vary because of liturgical season, special feast days, and so forth. The translation work of the USCCB is now complete. The next step is Vatican approval (called "recognitio"), after which this new translation will be published, disseminated, and implemented throughout the country. That's still a ways off, but all the bishops I spoke with concur that it's not too early to begin to instruct priests and laity alike regarding the changes, with a view to fostering the authentic revival of liturgical life that Vatican II envisioned. So this could be a very significant, hope-filled moment for the Church in the United States. The USCCB Committee on Divine Worship has an excellent website that provides very important liturgical catechesis (learning from mistakes made in the 1960s and 70s). Check it out . The bishops also approved a new pastoral letter on marriage entitled "Life and Love in the Divine Plan." This document has been praised for its orthodoxy by many episcopal and lay leaders (and criticized for the same reasons in dissident Catholic publications). The key, as pretty much all the bishops recognize, is how effective of a pastoral tool it becomes. Many an orthodox Church document has collected dust rather than serve as a catalyst for positive change. For that reason, the bishops have a variety of follow-up projects planned, included a significant upgrading of the "For Your Marriage" website, which I criticized early on, but which subsequently has taken more positive steps. I think there is a lot of promise here, and Archbishop Kurtz and other bishops on the committee that deals with marriage and family issues are to be heartily commended for their efforts. Next the bishops approved part five of Ethical and Religious Directives for Catholic Health Care Services, dealing with the obligation to provide medically assisted nutrition and hydration to those who can't take food orally. This directive needed to be revised to provide further clarity, drawing from recent statements of the Holy See. One of the topics of debate was the use of the term "permanent" instead of "persistent" in the phrase "persistent vegetative state." Bishop Vasa, episcopal advisor to the Catholic Medical Association, made an excellent clarification, noting that "persistent" is a diagnosis, while "permanent" is more of a prognosis, the truth of which will only be known after the person dies. For this and other reasons, the document retained the "persistent" language initially proposed by the doctrine committee. Last but not least, the bishops approved a document entitled "Life-Giving Love in an Age of Technology." Obviously such a document is important given the various, evolving technologies, as some of them (e.g., in-vitro fertilization, cloning, embryo donation, etc.) are contrary to Catholic moral teaching. This document is very pastoral, as the committee worked closely with couples that have experienced infertility, and they strove to encourage, guide, and offer alternatives rather than simply condemn the condemnable. (b) Cardinal Rigali's assurance to the conference that the Pro-Life committee's website would be regularly updated in terms of its moral assessment of emerging reproductive therapies, so that Catholic couples and others will have access to the Church's authoritative stance on these new technologies as they develop. But the second day wasn't quite over. Bishop Roger Morin of Biloxi gave an impassioned pitch at the end of the day's session in support of the Catholic Campaign for Human Development (CCHD), which has its national collection this weekend in parishes throughout the country. The CCHD has had a controversial history, most recently in connection with its funding of ACORN. Bishop Morin's address, given his leadership role with the CCHD, was understandable, and surely many worthwhile projects have been funded through the years. At the same time, I thought some of his rhetoric was unduly inflammatory. He suggested that at least some who raise concerns about CCHD "don't accept the social teachings of the Church" and are motivated by ideological or even political motives to make "outrageous" claims and espouse "untruths" that "cause hurt." What do we make of all this? Well, this is a topic that the bishops are going to discuss behind closed doors (which doesn't do the rest of us who are asked to open our checkbooks this weekend for this controversial collection amidst a still-weak economy a lot of good). In Kansas City we're truly blessed to have Bishop Finn, who carefully reviews requests for CCHD funding within the diocese to ensure its compatibility with the Church's faith and mission. Bishop Finn identified a few local recipients of CCHD funds that are indeed worthy beneficiaries of this collection. That still leaves as an open question how the funds are being used in other dioceses and even more on the national level. One bishop told me simply that his diocese no longer does the CCHD collection. Other prominent bishops explained that Catholics just need to be prudent. If we're concerned about how the CCHD funds are being used, then we should give elsewhere. Another archbishop added that the faithful have raised honest questions about the CCHD, and they deserve a response. The idea of a CCHD is a good one, but many bishops do recognize a need for an internal purification so that it achieves more fully the noble ends for which it was created. For now, I'd simply like to be a fly on the wall when the bishops discuss this behind closed doors. After the day's session ended, I sat down briefly with Archbishop Carlson of St. Louis. I mentioned yesterday what a fine selection he was for the chairmanship of the committee on clergy (including permanent deacons), consecrated life, and vocations. I asked him what motivated him to run for this office. He simply responded, "It's about service." His brother bishops asked him to throw his hat in the ring, and he saw in this a special call to serve the People of God. Right there we see the beautiful mindset he brings to vocation work. Also, since becoming Archbishop of St. Louis, he has had weekly open houses at the Archbishop's residence on Fridays for his priests to come for fellowship. Already dozens of priests take part in these, as he builds a strong fraternity with his priests. It's hard not to walk away from a meeting with him without feeling a little bit better about our Church. So far, the biggest development in the second season of the NBC comedy, Parks and Recreation, has been the transformation of a pit into an empty lot. Since the very first episode of the first season, the premise of the show has been that a huge pit - left over from an abandoned construction project - has been sitting in the middle of a residential neighborhood in the small town of Pawnee, Indiana. City Hall had been doing nothing about it. A local nurse named Ann Perkins (played by Rashida Jones, formerly of The Office), who lives next door to the pit, brings her complaint before a town hall meeting with the Department of Parks and Recreation. There she meets Leslie Knope (Saturday Night Live’s Amy Poehler), a dopey mid-level bureaucrat and naïve idealist, whose heroes include Madeleine Albright and Condoleeza Rice. Knope decides that the pit must be filled in and turned into a park for the neighborhood. Ann loves the idea. A cause is born. Now, mid-way through the second season, funds have been allocated, and the pit has been filled. But the lot is not yet a park, and the golden thread of the show - the comic travails of a warmhearted idealist attempting to force her noble mission through the jungle of bureaucracy - is still the central drama. It’s The Office for the age of Obama, and it taps into our subconscious national affection for the New Deal. While the show can get preachy at times - Knope’s boss, Ron Swanson (Nick Offerman), is a cynical, twice divorced, “anti-government” tough guy in favor of privatizing the Parks and Recreation Department that he himself is in charge of - it’s good to know that TV writers can still write affectionately about a do-gooder in government, living in a world where she could actually do some good. There is a default feeling of optimistic idealism in our national soul, and this is true even of TV writers. It is a feeling that no one, not even Ron Swanson, can quite stamp out. But this is also the central flaw of the show. It is afraid to question its own idealism, and it is afraid to directly mock the absurd. Like The Office, Parks and Recreation is filmed in mokumentary style, with one camera floating around, capturing the daily life of a place of work from different angles. It is a style suited for satire. It captures the raised eyebrows and the awkward pauses. The first, say, two-and-half seasons of The Office used this to maximum satirical effect. They were shows which confronted and mocked the absurdities of office life, like email filters and diversity training seminars. At some point, however, The Office transformed itself into a phantasmagoria, a show in which, instead of confronting the soul-crushing realities of the workplace, always provides a way for the workers to escape. Not actually escape, of course, but escape within their minds. They become schoolchildren. In last week’s episode of The Office, with all the characters confronted with the possibility of their company filing for bankruptcy, the manager decides to divert his workers with a game of “Murder.” Literally, he explains that this game is a diversion, and that he is “doing it for the kids.” The kids, meaning the workers. Parks and Recreation is a show with the same attitude. Its characters behave as kids do. The Halloween episode three weeks ago contained this central psychological drama: Ann Perkins was afraid that her Halloween party was boring. This past week, everyone in the department was assigned to draw a picture that they thought represented the “spirit of Pawnee.” This was followed by a show-and-tell, grade school style, which was funny because it was silly, not because it was satirical of anything government-related. A few episodes before that, Leslie Knope had to confront her shyness and awkwardness about going on first dates. Her love interest, Officer Dave Sanderson (played by the otherwise brilliant comedian, Louis C.K. ), is exactly as awkward and shy as Knope when he asks her out on that date - exactly as awkward and shy, that is, as a 14 year old. It’s the social dynamic of Saved By the Bell, forced onto a different social context. The problem with the show is ultimately a lack of courage. A satire is supposed to look at the absurd facts of life straight in the eye and laugh defiantly. What Parks and Recreation does is look at the absurdities of life, shrink back, and play silly or sentimental games. 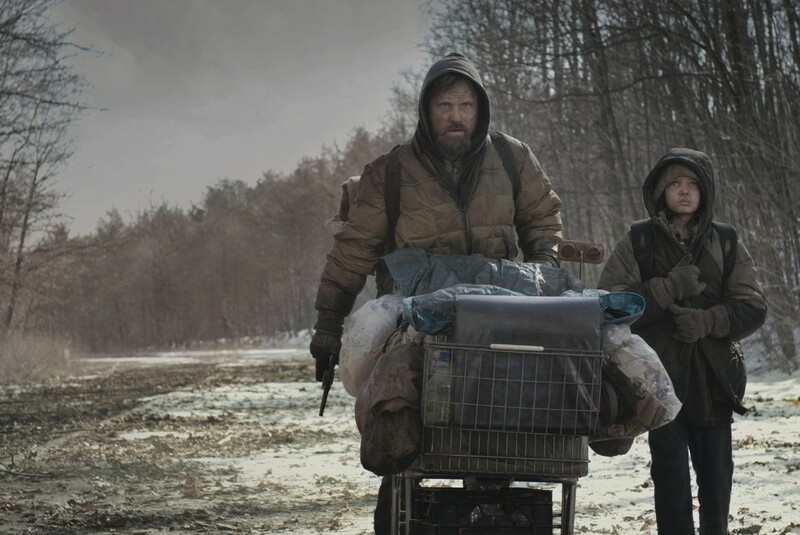 That’s all well and good, I guess, “for the kids” - though last time I checked, unemployment was at 11 percent, 17 percent if one uses a different statistical model. Courage before such facts requires at least a smidgen of hope, or a sense that reality is a gift and not a neutral playground where we are ultimately disappointed. I want a comedy both ruthless and hopeful, not optimistic and childish. (a) The approval of five items that will conclude the work of the U.S. bishops in translating the new Missal into English. If passed, official recognition is needed from Rome before the new translation will be published for use throughout the United States. (b) The approval of a new pastoral letter on marriage, called "Love and Life in the Divine Plan." (c) The approval of a new document on reproductive technologies, entitled "Life-Giving Love in an Age of Technology." (d) Revision of the section of Ethical and Religious Directives for Catholic Health Care Services that relates to the provision of nutrition and hydration to patients in a "persistent vegetative state." One thing the bishops did do today was to adopt as a body the statement of Cardinal Francis George, president of the USCCB, regarding the moral dimensions of the healthcare debate, especially the firm position of Catholic leaders that no federal funds be used to pay for elective abortions. Several of the bishops with whom I spoke are looking forward to the approval of the English translation of the Roman Missal as the end of a long, difficult process. Bishop Robert Vasa of Baker, Oregon told me he thought this would help bring about a revival of liturgical sensibilities that would touch all the faithful. This thought was shared by Bishop Kevin Rhoades, the new Bishop-designate of South Bend-Fort Wayne, Indiana, who stressed the importance of catechetical preparation for the changes, especially among priests. He too sees the importance of taking advantage of the new translation to deepen the liturgical life of the local Churches. And as Bishop Thomas Doran of Rockford, Illinois, adds, this new translation, which is more faithful to the original Latin is, at the end of the day, doing what the Holy Father wants. There were several touching addresses during the afternoon, including an address by Fr. David O'Connell, outgoing president of Catholic University of America, and one by Archbishop Pietro Sambi, the apostolic nuncio. The latter stressed three key qualities of bishops as servants of the Gospel: fidelity, prudence, and goodness. "We have recently begun discussions on how we might strengthen our [the bishops'] relationship to Catholic universities, to media claiming the right to be a voice in the Church, and to organizations that direct various works under Catholic auspices. Since everything and everyone in Catholic communion is truly inter-related, and the visible nexus of these relations is the bishop, an insistence on complete independence from the bishop renders a person or institution sectarian, less than fully Catholic. The purpose of our reflections, therefore, is to clarify questions of truth or faith and of accountability or communion among all those who claim to be part of Catholic communion." One thing that's a little different this year is that EWTN is not providing live coverage, though Raymond Arroyo is here and will do "The World Over" broadcast on site. Instead, coverage is provided by Telecare, the television station of the Diocese of Rockville Center, NY. The bishops I spoke with were surprised with this development. Certain obvious inferences may be drawn from this change, but I'm trying to get a more definitive explanation. For those who want to follow this year's meeting online, there will be streaming video at http://www.telecaretv.org/. In addition, the U.S. bishops' site will be posting election results, approved documents and statements, etc. This morning I attended Mass with 200 bishops and maybe two or three dozen non-bishops, with most of them being priests or religious. Among the various bishops I was privileged to greet before and after, the most moving for me was my encounter with recently retired Bishop D'Arcy. I like to think that I spoke for many in thanking him for his faithful service to the Church, and especially for his courageous stand this past year regarding President Obama's commencement address at Notre Dame, where he also received an honorary degree in law. Bishop D'Arcy was very gracious and appreciative. This past Saturday, Bishop Kevin Rhoades of Harrisburg was named Bishop D'Arcy's successor as "Bishop of Notre Dame". Bishop Rhoades has distinguished himself in Harrisburg, so much good can be expected from this appointment. The U.S. House of Representatives has advanced major legislation to provide adequate and affordable health care to all. The Catholic Bishops of the United States have long advocated that adequate health care be made available to everyone. In an essential step, the House voted overwhelmingly to reaffirm the longstanding and widely supported precedent that no federal funds will be used to pay for elective abortions. In doing so, the Representatives honored President Obama’s commitment to the Congress and the nation that health care reform would not become a vehicle for expanding abortion funding or mandates. The Conference will remain vigilant and involved throughout this entire process to assure that these essential provisions are maintained and included in the final legislation. We will work to persuade the Senate to follow the example of the House and include these critical safeguards in their version of health care reform legislation. We also thank the members of the House who took this courageous and principled step to oppose measures that would force Americans to pay for the destruction of unborn children, and the Democratic leadership for allowing the Representatives to vote on this amendment that protects the common good. In the national discussion on how to provide the best kind of health care, we bishops do not claim or present ourselves as experts on health care policy. We are not prepared to assess every provision of legislation as complex as this proposal. However, health care legislation, with all of its political, technical and economic aspects, is about human beings and hence has serious moral dimensions. Our focus is on the reality of families with children, the poor and the elderly, the mother carrying a child in her womb, those with limited or no means of access to doctors. Our Catholic commitment to health care picks up the pieces of our failing system in our emergency rooms, clinics, parishes and communities. All this undergirds our commitment that our nation’s health care system needs reform which protects human life and dignity and serves the poor and vulnerable as a moral imperative and an urgent national priority. We remain deeply concerned about the debate that now moves to the Senate, especially as it will affect the poor and vulnerable, and those at the beginning and end of life. We will continue to insist that health care reform legislation must protect conscience rights. We support measures to make health care more affordable for low-income people and the uninsured. We remain deeply concerned that immigrants be treated fairly and not lose the health care coverage that they now have. We will continue to raise our voices in public and in prayer; we ask our people to join us in making the moral case for genuine health care reform that protects the life, dignity, consciences and health of all. I am happy to add my support to the statement of Cardinal George and the USCCB concerning the status of health care reform. Let us continue to work and pray that these efforts will move forward in a way that supports and protects the life and dignity of the human person. The Benedictines of Mary Queen of the Apostles are a traditional monastic community whose purpose is to pray for the holiness of priests and for vocations to the priesthood. They were invited to Kansas City in 2006 by Bishop Robert W. Finn and their prayers have led to an abundance of priestly vocations in Kansas City. The number of sisters is growing by leaps and bounds as well and most of them are young enough to get carded (not that they have the opportunity). The sisters support themselves by making vestments and with their angelic voices. Their first CD, Echoes of Ephesus, sold 60,000 copies and included original compositions – one written specifically for Bishop Finn. This year they have a Christmas CD. Proceeds from the CD go toward building a monastery for the sisters. Take a listen to some samples from the CD below the story and you’ll be convinced you and your friends need to own this. You’ll be adding to the prayerfulness of your Christmas, contributing to the holiness of priests, fostering new vocations and building a monastery, all for $20. KANSAS CITY ― Although you just looked out the window and saw people in T-shirts and shorts, the Christmas season is drawing near. 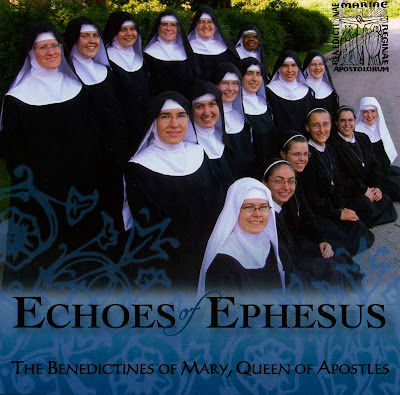 Pop the new “Christmas at Ephesus ” CD by the Benedictines of Mary Queen of Apostles in the player, close your eyes and you are transported to a stable on a snowy night in Bethlehem . Crystalline voices, woven harmonies, and medieval chants bring that first Christmas into the room. The Benedictines of Mary Queen of Apostles are still new to the Kansas City Catholic community, invited here by Bishop Robert W. Finn in 2006. A traditional monastic community of women who desire to emulate the Blessed Virgin Mary by living in quiet seclusion at the Priory of Our Lady of Ephesus, encouraging, praying for and supporting priests, they are a joyful group who sing while at work, at prayer or at play. They recently broke ground for a new monastery near Gower. The proceeds from the Christmas CD will go toward that building plan. The sisters have been encouraged by the success of the CD released last year. Nearly 60,000 copies were sold or given out. For this recording, the sisters began with 60,000 copies. Their music and charism caught the attention of Ian Byrne, a Kansas City businessman and lead singer for the local Irish band The Elders. Through Byrne, the sisters connected with Steve Phillips, a recording engineer and musician with the band. With his assistance, the CD was recorded at Conception Abbey, where the acoustics are just right. Production costs were reduced by packaging the discs in cardboard cases. The CDs, Christmas at Ephesus and Echoes of Ephesus, can be purchased for $20 online at the community’s website. The Sisters’ first CD is also still available. A second CD purchase is only $15. Here’s the cover and a couple of sample tracks from the first CD.